When I was doing some research on all there is to see and do in Boston after winning the HomeAway BlogAway contest, I knew we'd be visiting on a very crowded holiday weekend (July 4). I was hoping to find a few off-the-beaten path activities that might be a little more quiet than the typical Boston attractions. 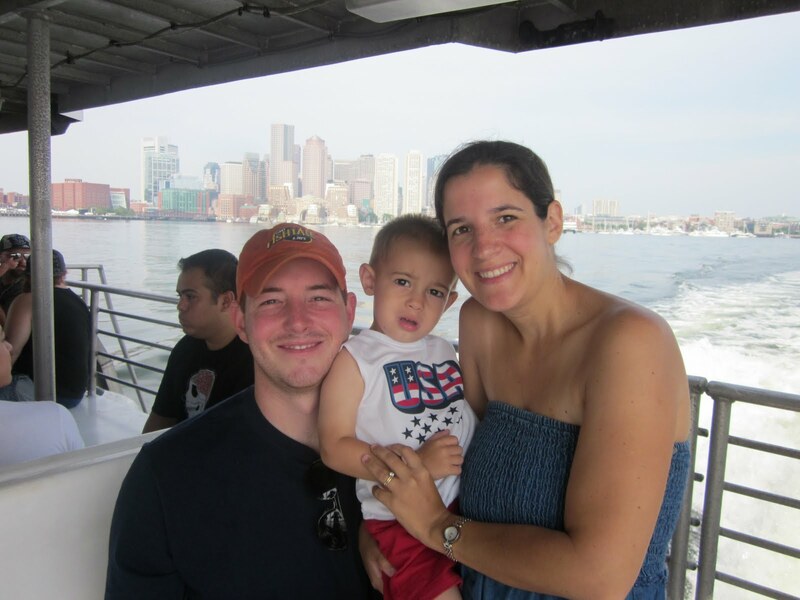 A ferry boat ride out to Georges Island, one of the Boston Harbor Islands, was a great option. (Do you see any people in the photo above? Ahhh...) We spent a fantastic morning there, which proved to be a good strategy for escaping both the crowds and the heat. Our adventures started with a ferry boat ride. Georges Island is 7 miles from downtown Boston, which translates into a 20-minute boat ride. The ride itself is a real highlight of a trip out to the island. You get spectacular views of the skyline, the harbor is fairly gentle (I still got a little seasick, but I'm a big wuss), and the breezes were a welcome relief from the pounding sun. The arrow thought riding a big boat was tons of fun. You can purchase your ferry tickets in advance at the kiosk along Long Wharf North, near Quincy Market. I recommend doing so. Our ride out to the island was absolutely full, standing room only. 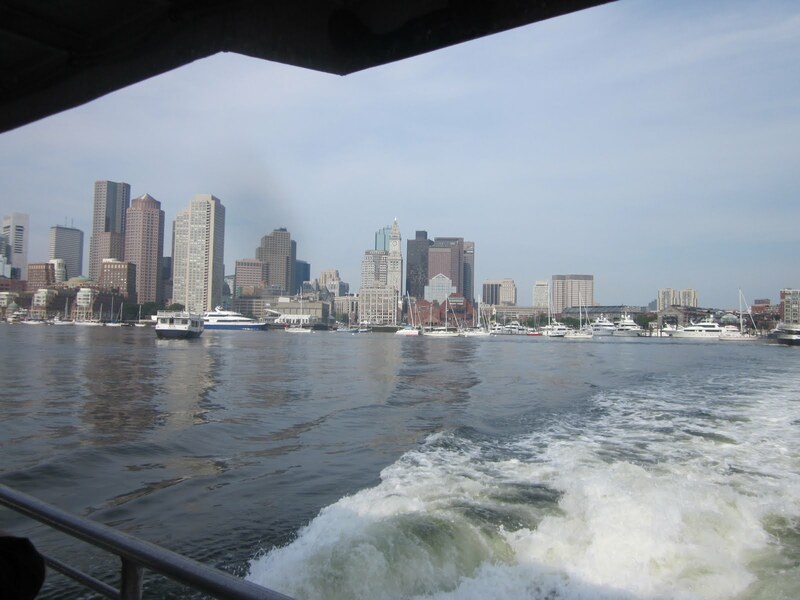 It will become very clear as you board the ferry that Boston locals head out to the island for a picnic, while out-of-towners visit to sightsee. You'll see folks carrying on coolers, grills, etc., with intentions to spend the whole day there. Our first stop was the information area on the island to pick up a brochure so we could guide ourselves around Fort Warren, which dominates the island. 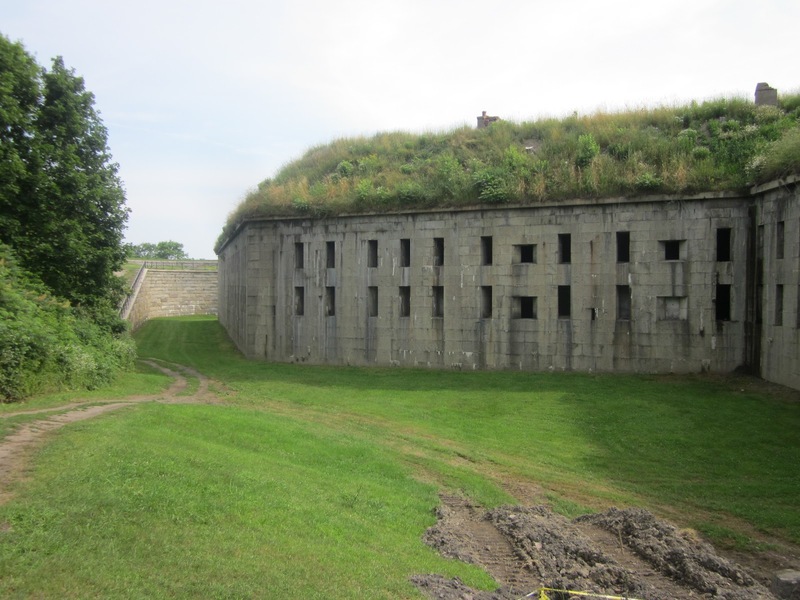 Fort Warren was used as a jail for Confederate soldiers during the Civil War. 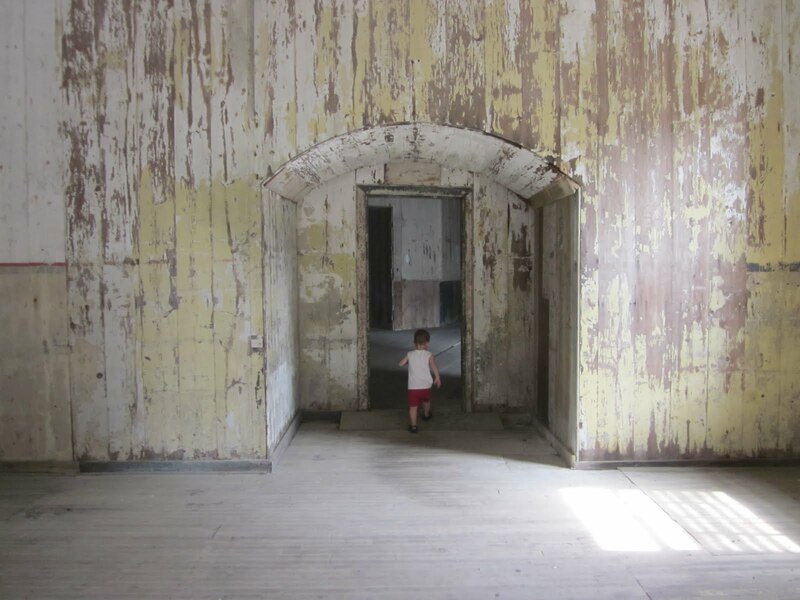 If an old jail can be both spooky and beautiful, then this place was. The arrow thought it was great fun to run through the empty old rooms. If you have boys, they'll love all the canons on display. There are signs all over Fort Warren describing the various aspects of the building, life on the island, etc. It's fascinating stuff, and full of information that even kids would find interesting. Keep an eye out for those. Climb to the top. You're free to roam all over the Fort, including climbing the stairs up to the top. Here you'll have gorgeous views of the harbor, perfect for pictures. 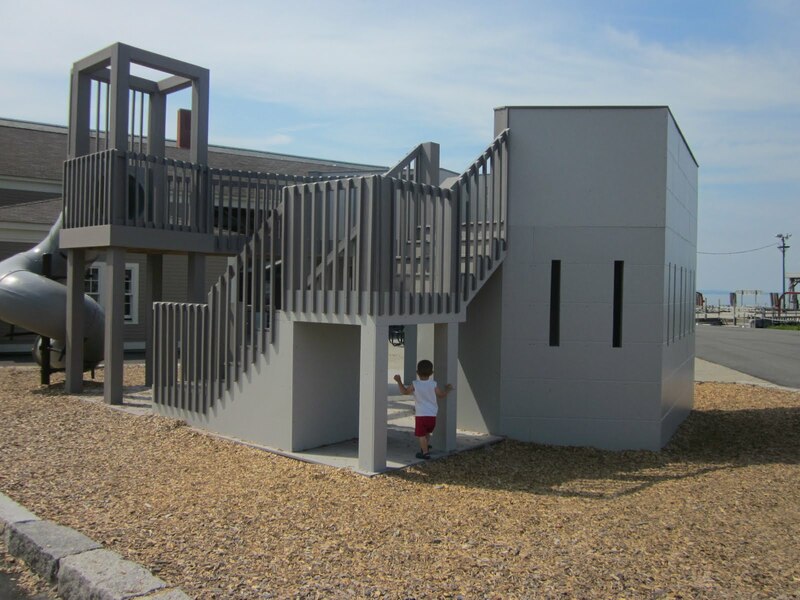 We ended our visit by letting the arrow run around the playground (designed to resemble the fort itself!) He didn't want to leave but luckily another fun boat ride awaited him. Roundtrip tickets cost $12 (children 3 and under are free but must have a ticket). Visiting the island itself is free. The first ferry departs downtown Boston at 9 a.m., and then every hour on the hour. The last ferry leaves Georges Island to return to Boston at 5:30 p.m. during the week and 6:30 p.m. on weekends (summer schedule). If you're visiting with young kids and don't plan to have lunch there, I would plan to spend about an hour on the island. Otherwise, the rangers suggest 2 hours for a visit. There is a snack shop on the island if you don't pack your own picnic. It wasn't open before we departed (at 10:30 a.m.) but the menu looked good! Our biggest struggle was whether or not to bring our stroller. In the end, I'm glad we brought it. It was nice to just push the arrow to and from Fort Warren's grounds from the ferry dock. Otherwise, he walked or was carried during most of our time touring the Fort. My one complaint? There was no diaper changing table (that I could find). We managed, but it sure would have been nice. And considering the many young kids we saw on the island, I doubt I'm alone in this need. 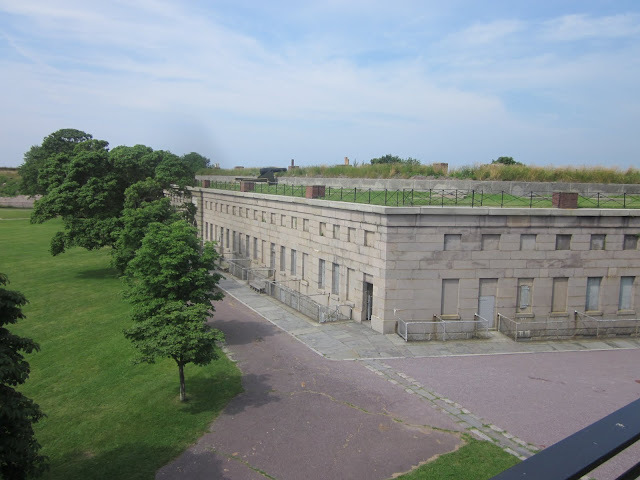 Disclosure: While HomeAway covered many of our travel expenses for our trip to Boston, we paid for our trip to Georges Island and all opinions are my own. We were in Boston for 4 months - February to the end of April- and though we took the ferry from Quincy to Boston quite often, we never did make it to Georges Island. Thanks for the tour- it's someplace we hope to see in the future. what FUN! i love boat rides, and watching the wake out the back. that photo of the arrow in the doorway? amazing! You like to travel as we do...avoiding the worst of the crowds and the heat! We've talked about Boston, and this would be an excursion we'd both enjoy. The Arrow looks just like you! Cute pics. This looks like a fun place, but what I really noticed was how great you look for halfway through a pregnancy. You are glowing for sure!